Every so often, on the Internet, you come across these fun features that show pictures of celebrities when they were young – before they were famous – and ask you to guess their identity. Try your hand at some of these. Recognizing someone’s true identity can be challenging. In the Gospel of Matthew, Jesus tells a parable about recognizing the true identity of others (Matthew 25:31-46) – (Parable of the Last Judgment). The key to this parable is in recognizing Jesus’ presence in others. The righteous people say, “Lord, when did we see you…” They claim that, if they had recognized the presence of Jesus in the hungry, the thirsty, the stranger, and so on, they would have responded differently. This week, we are going to explore how the way we respond to others has everything to do with recognizing the presence of Jesus within them. That begins by recognizing every human being’s dignity. Think about someone you know or know of who is a very dignified person. Chances are, when you refer to someone as being very dignified, it means that you see that person as someone who acts with honor and distinction—someone who acts as one with status that is worthy of respect. Human dignity is at the very heart of Catholic morality. The moral life is the third pillar of the Catechism of the Catholic Church. To live our faith—to live a moral life—requires us to have an understanding of, not only human dignity, but also, grace, sin, and mercy. Grace is not something quantifiable. It is not something that we store up. Grace is a relationship – our relationship with God. When we are in the state of grace, we are in a healthy relationship with God, filled with God’s life. Sin is the ignoring, injuring, or rejecting of our relationship with God. And since God has indicated clearly that loving him is inseparable from love of neighbor, we know that sin is also the ignoring, injuring, or rejecting of our relationship with others. Mercy is another word for compassion or kindness that is directed toward an offender. Mercy is what God always offers to us, despite our offenses. God’s mercy does not have to be begged for. It is offered to us as a gift. Sin is not the end of the story. Mercy is what awaits us. God’s merciful love calls us out of sin and redeems us – saves us, delivers us – from every evil, and restores us to grace. Our Catholic understanding of human dignity, grace, sin, and mercy means that we see living a moral life as an act of worship – a way of aligning ourselves with God, who is love. It means that we cannot separate love of God and love of neighbor. Loving our neighbors is how we encounter God, in whose image we are all made. It means that we strive to treat people with respect, recognizing the Divine Presence within them. Reflection Questions: Choose one of the following questions and share your thoughts with your fellow retreatants by adding your comments in the comments box below this post. Describe an experience you had of treating someone gruffly (or perhaps just ignoring them), only to find out later that the person was someone of lofty status. How did you feel? What do experiences like that teach us about human dignity? What kinds of sin do you see as most prevalent in today’s society? What can Christians do in response? During this Year of Faith, how can you help others to recognize and accept God’s mercy? I hope you’re enjoying our online summer retreat, Preparing for a Year of Faith! Take a few minutes each day at your convenience to “gather” here on my blog as we seek to add some flavor to our faith lives by deepening our understanding of the truths of our faith as given to us in the Catechism of the Catholic Church. 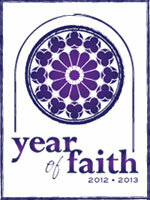 Learn more about the Year of Faith. Watch a brief video explaining what this online retreat is all about. Join Me on a VIRTUAL Pilgrimage to Italy! I think that we are most guilty of treating our own family members loftily because we take them for granted. This often happens with my parents and children. Sometimes I lose my patience with them over something I believe is very obvious or simple and I feel that it should be obvious to them too. On occasion I’ve not treated them with respect then I must apologize. Dealing with people a a day-to-day basis brings us closer to them and sometimes one takes them for granted. We must be careful with this carelessness because it is hurtful. Jesus’s presence in others is sometimes buried under emotions or feelings such as selfishness ,greed ,prejudice,hatred , vanity to mention just a few. As Christians we are called to look beyond these superficial actions but this is not very easy to do when we think all our efforts of trying to get along with a very difficult person are to no avail and we end up feeling ridiculed or rejected. We should pray to the Holy Spirit to guide us and help us to use His fruits to seek out Jesus in the most awkward of personalities. We must use patience kindness self control and most importantly love and these will help us to see Jesus in everyone we meet. I feel the kind of sin I see most is people who don’t go to Mass because it doesn’t fit into their schedule or lifestyle. I try to get across to my students that they are old enough (8th graders) to get to Mass themselves and it is their responsibility to “keep Holy the Lord’s Day”. If they can’t find a convenient time in their home parish, there are parishes nearby with different Mass times. I try to share what I receive from going to Mass and that they can also share in being fed emotional & spiritually. The other sin I see most is Gossip people love to talk badly about people they love to complain and misery loves company. I always try to teach my kids if it is pure gossip if you do not have anything good to say than do not say anything at all. I say this to adults also! How are we supposed to love one another if we can’t find anything nice to say about each other? •How does Jesus’ Incarnation—his becoming flesh—bring greater dignity to humanity? I recently enjoyed a museum in Indianapolis that had wonderful displays of Native American culture from years past. The question that has been rolling around in my head is how our country would be different if our forefathers would have seen Jesus in the Native Americans? Was wondering how Jesus felt when we decided that this was our land, not their land who had been living here for so many years with quite an amazing culture? Who today am I called to see and treat with dignity, respect, love? I liked the additional reading, The Two Standards. That image of a battlefield with two sides squaring off, each with their banner. One side – the banner of Evil and the other the banner of Jesus. We have to choose and keep choosing all day long. Banner of evil – great riches, power over and the banner of Jesus – simplicity, humility, generosity. The sin that I think is the greatest in the world today is selfishness. This is a very materialistic world. The only words in some peoples vocabulary today are I, Me, Mine. The past couple of years I taught middle school and high school children. I taught them it’s not all about them. Through a community service project they learned that there are so many people who need help. After the project we shared our feelings about the service they performed. All of them shared that they didn’t realize how fortunate they were. Also how good they felt to be able to be able to help. It was A blessing for me to hear them share their good feelings. We have tried very hard over the past few years to be a welcoming parish community. It’s not always easy, because we have to welcome with equal dignity those who only come to Mass at Christmas and Easter and those we see every week; to try to meet the needs of busy, but sincere, families who want to share and celebrate their faith, but have trouble making it to classes. It’s not a matter of waiving requirements and having no standards but of working with them to find other ways of meeting requirements. So for me, the temptation to sin is the temptation to be dismissive about the needs of people who are different from me and the Christian response that I must make is to meet them where they are and share Christ there. I think it is so difficult to find the presence of Jesus in others because we picture Jesus as always kind and generous and good. Sometimes we have to look past someone’s hard outer shell to find Jesus within. Sometimes He’s just screaming to be discovered. It’s had to remember that God created each and every one of us in His image…we have to look hard sometimes and we live in a world where the quick, easy answer is the only one we look for.